Welcome Peter this is a great forum for info, helpful and knowledgeable people on here. The mounting lugs top and bottom seem quite fragile, especially now they're 30 years old. I had to strengthen mine with Plastex otherwise they'd probably have fallen off too. Fairly easy to find the panels on Yahoo Auctions Japan though, last time I looked anyway. 1984 KR250A owner in South Africa. Currently busy with full resto. Any other South Africans on here ? Busy with my restoration in South Africa. Should be finished end of September 2016.
i am a new kr250 ownwer i bought my kr in december (from Ebay) near Hull in UK . I live in Britanny (north werstern France ) . I started visiting http://www.KR250.org several years ago . It has been a long time that i fancied getting a tandem twin . The bike is fairly complete and in a fair state (not perfect but quite good for a 30+ motorcycle ). + japanese part book for A2 , a part book for A1 is on its way from Japan . - i have the KVSS system (which is cool ) and the improved primary gears dampers . - head gasket on A2 is unobtainium (Kiwami kits are available for A1 on Yahoo Jp). can somebody correct me if i am wrong ? wondering , why none of my post have appeared on the board so far ? Hi KR Folks, new from Florida USA. 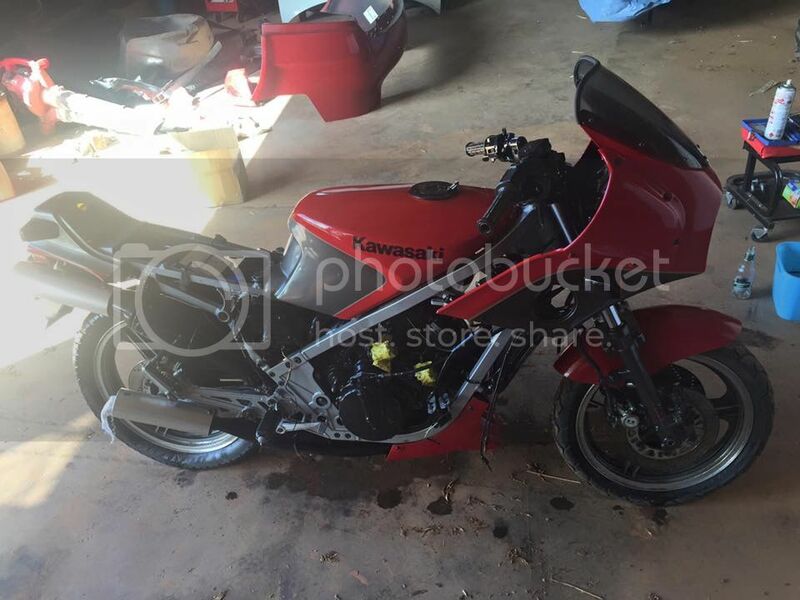 Excuse my inexperience ahead of time, not a forum user normally and new to my 1984 KR250. I hope to find help to get her dialed in. Imported her from Japan this past fall and was pleasantly surprised by the condition. Less than 3100km. Thought I had it dialed in after some troubles but went to ride it this weekend and the troubles came back. Quick history: Started right away, should not have done that, should have pulled it apart and inspected everything first, but it was positive. Ran progressively worse. Pulled it apart to do the check up. Found disconnected coil wire!! Happy. Cleaned tank, found powdered air filter sucked into carbs.. cleaned. Checked all connections, new battery, new plugs. Kicked the heck out of it and it fire occasionally, teasing me. Checked spark and it was sporadic, bought used left CDI and voltage regulator. Started like it was brand new, first kick, thought I had it!! Month later went to ride it and it started after a few kicks but was not as crisp. Stalled, tach working on and off this whole time but working the last time it ran. Spitting heavy oil out of lower pipe, has done this the whole time, figured it was build up from all the previous kicking. Would not start, as if the kill switch was on. I choked it and gave it full throttle, it finally fire up but ran crappy. Top pipe not firing unless I choked it all the way, bottom spitting heavy oil. Tach not working at all now?? Replaced plugs again, pulled carbs and cleaned them, they looked pretty good, small sediment from old filter I assume. Adjusted carb slides, removed inline filter I had as it seemed to be starving. It would start and be boggy and weak then would go for a bit and I could blast off to 9000 rpm, then stall and one cylinder not firing unless I choked it again. Tach not working... Seems like a few things, electrical and fuel. Could it also be the internal seals hence the oil spitting out the lower pipe? Is the right CDI now acting up hence the tach dead completely? 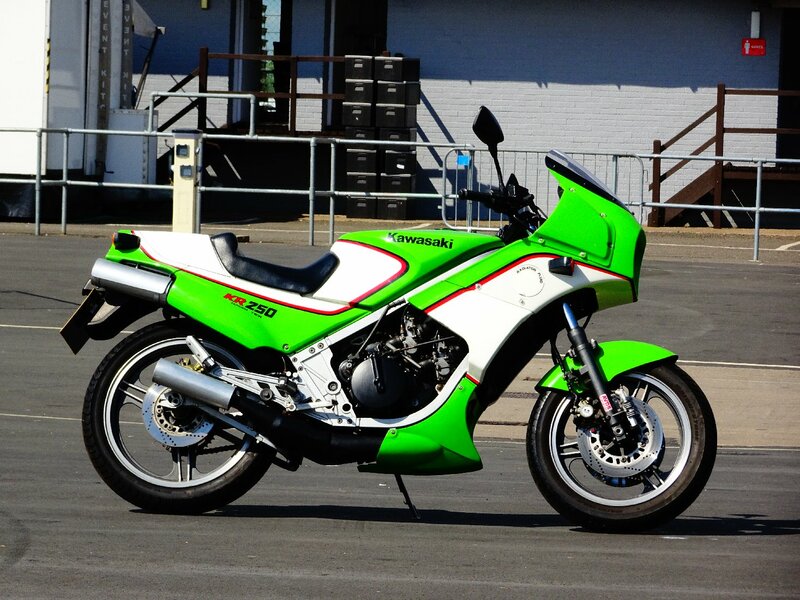 Hello, I am from Athens and I am interested on buying a kr250 which is resprayed green white with a blue line like a 1985 GPz 900. It has different front indicators and it is actually working and the mirrors are missing too. Unfortunately I don't know how to upload pics here. Should I buy it? And how much should I pay? Just giving this post a little bump, in the light of the new Forum Admin and the push to breathe new life into this forum. Give us all an update on your KR, especially if you've not posted about it before. I've not done a lot with mine since it was at the Donington Endurance Legends event back in May. I've also joined the club. Nice original 1984 KR250A, to add to the collection. Don't think it has ever been apart. What a charismatic little road bike. I love it. Just sorting the notorious cold starting problem at the moment. Last edited by Cexley on Wed Jan 02, 2019 12:02 pm, edited 1 time in total. Please be patient, I have a bit of a backlog in posts to approve, they are caught up in 168 pages of spammers and inappropriate material. Anything that has been stuck for over 12 months in limbo will be scrapped with all the crap. Thanks to Tim (and some technical words of wisdom), I am now able to work through the backlog.